Soon after converting the Brillie clock (link here) another european slave clock was brought in. This one has no maker’s name, is about 15ins across, and the only markings are the numbers “46” on the slave mechanism and on the hands, and a hint of a “cross” on the number 7 on the dial. 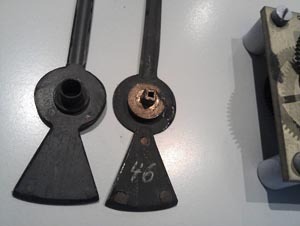 Once again a UTS high torque quartz movement was used, and again the hands needed some careful broaching and a euroshaft collet. A round access hole was cut in the rear of the case to allow the hands to be moved and batteries replaced without dismantling the clock. 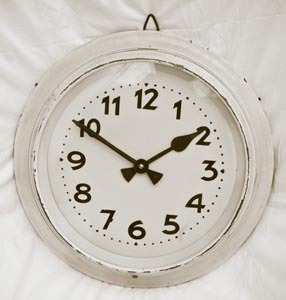 Brought in recently, a large (12in glass) school or factory slave electric clock. These clocks work on pulses sent every minute or half minute from a master clock. 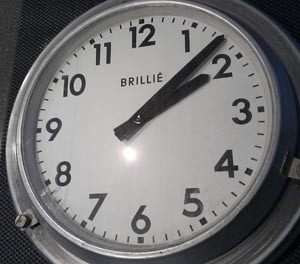 This one is French, with the maker’s name, Brillie, painted on the dial. 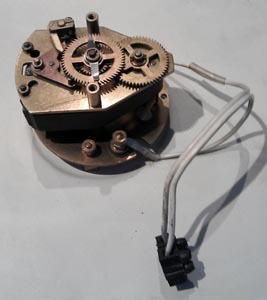 The mechanism as fitted cannot be directly converted to battery or mains operation, and although there are add-on units which retain the pulse mechanism it is easier to install a quartz movement. I used a UTS high torque movement to cope with the large hands which the client wanted to retain. The hour hand was broached out to be a nice push fit on the Euroshaft spindle, but the minute hand needed a hand collet soldered to the underside. The mounting of the glass in the bezel also needed attention as the original plaster sealing had dried to a powder – transparent silicone did the job. 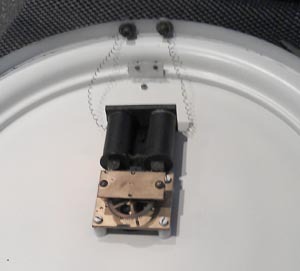 The dial and mechanism is retained by screws in a substantial spun aluminium case, and the final task was to cut a round access hole in the rear so that hands can be adjusted and batteries replaced without dismantling the clock.